You can create any project - Cards, Layouts, Albums, Altered items, 3D projects, Home Decor etc. 3. To pick up elements to create your project ..
4. Card, tag, mixed media, anything. Remember that you need to use Papericious products as your main focus to qualify for the win. The last date for submission of your projects is 9th August, 2017 at 11:55pm IST. Please go through the General Guidelines HERE before you link up your project. Any project not following the rules, will be disqualified and it will not be eligible for the prizes. We will be also be having a Random Winner from all the entries who enter their projects every month to win a Papericious 6 X 6" Pattern Paper Pad. Everyone gets a equal chance here so whether you are a novice or an experienced crafter, all are welcome to play along our challenges. 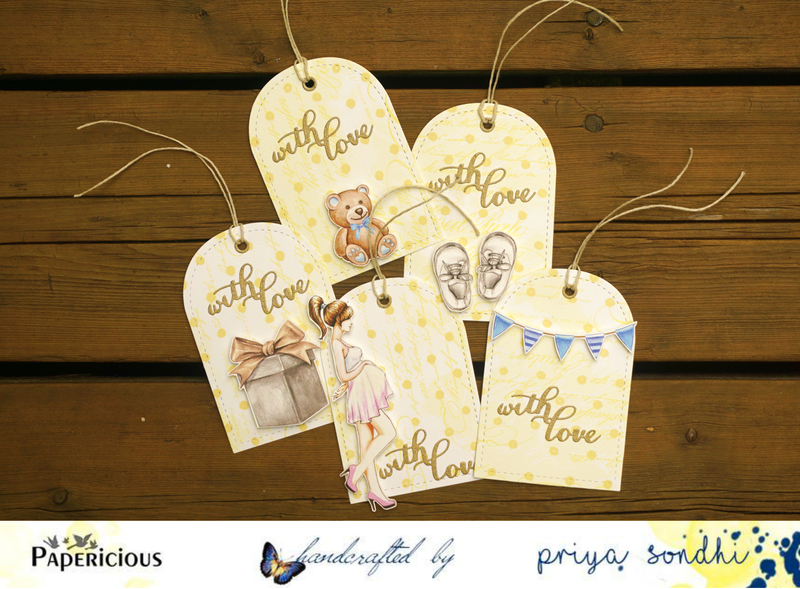 "Priya have selected middle row of "Glitter, Pattern Papers and Jute Cord"
to make this set of 5 baby themed tags. She had used "Mom To Be" Paper Pack and Ivory Jute Cord. 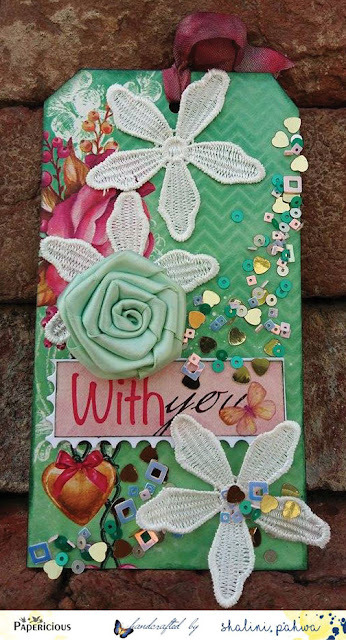 added some glittery sentiment using glitter paper." 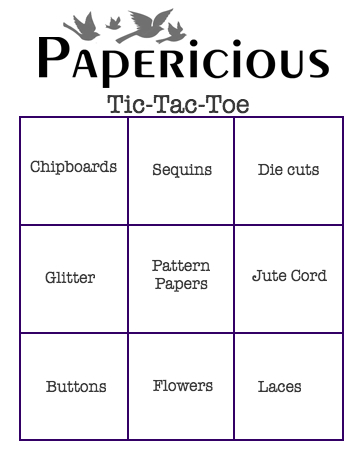 "I have selected vertical middle row of "Sequins, Pattern Papers and Flowers"
to make this tag. 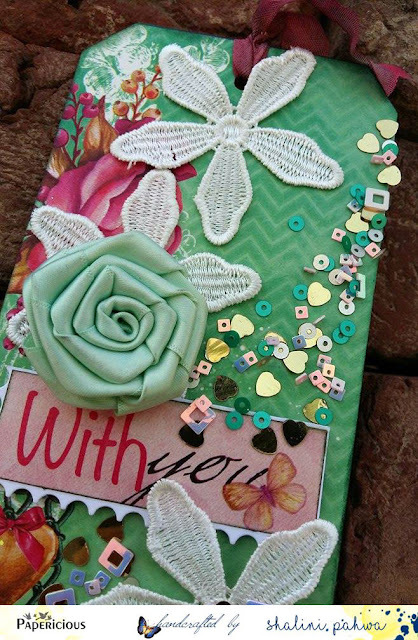 I have used "Blush" Paper Pack and sequins and flowers. and added the sentiment from the same pattern paper. 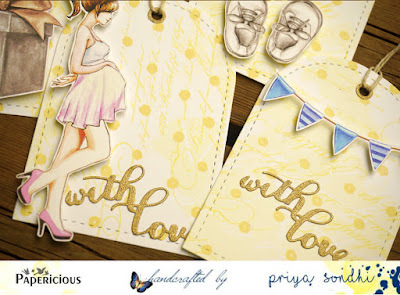 LOVE THE BEAUTIFUL CREATIONS AND INTERESTING THEME WITH VARIATIONS! Photo Folio with Azealian Papers!